This Mini Mail Box is the perfect craft to hold all your mail - a great Valentine card holder! Easy to make with simple supplies and our printable accessories! Preschoolers CAN do this craft WITH an adult! 1. First you will make the bottom of the mail box. Trace around the bottom of your box onto a piece of thin cardboard. 2. Draw rectangle "tabs" on all sides of your tracing. 3. Cut out and fold up each end. Put this aside until the end. 4. Now to make the mail box; Take your box and gently pull it apart at the seams until it is all unfolded. Cut the bottom tabs off the box (so that the bottom of your mail box is open). 5. Re-glue your box back together - backwards. Why? Because the plain inside of the box is paintable. Just glue along the seams where your tore it apart. 6. 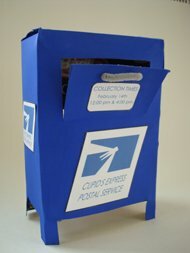 Cut your mailbox "legs" from the open bottom of your box. 7. Cut a flap in the front of your box for the mail slot (an adult may help by using a craft knife). 9. Poke two holes in the mail flap with a pen or pencil and insert a small piece of pipe cleaner (for the handle). Twist each end of the pipe cleaner to secure. 10. Glue on all your cut outs. 11. Take the small rectangular box that you made earlier. Slide it into the bottom of your mail box (don't glue it).